Em Stafrace| Just a Girl with Ideas: Can't Load my personalised blog background! 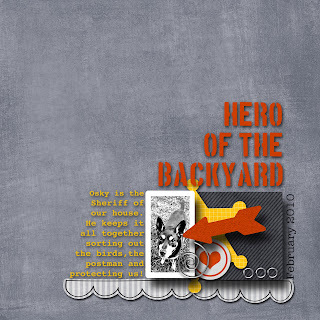 Can't Load my personalised blog background! I decided that I needed to update my blog banner then of course that became the background too and all went well until the nightmare began! I have been trying to upload my newly created blog background following step by step by step and yep more directions right down to the nitty gritty and for some reason can't get the damn thing to load...grrrrrr! Its also been a weird couple of days I have been soooooo close to tears that when Dan rang this morning they rolled on out, I nearly drowned the poor man, but Cookie being my bestest friend in the whole wide world, soon had me laughing my big toosh off...I think whats taken my good vibe away is that I'm turning 40 in a few months and I am s*#t scared that life is slipping me by way too quickly. Yeah, yeah I know that its not old but there are many reason for this little melt down of which I wont bore you with and I guess its just time to pull myself out of this silliness and start smiling again. Anyways I'm digressing, Dan asked me on the phone this morning what I was thinking of doing for my partay! All I have been able to come up with is a 'Motown & Funk' theme but then Dan came up with a suggestion I'm seriously considering, wait for it! Ring a ding a ling! By Jove I think we've got it! Faaar out 'Cookie' cracks me up! He went on to say we could all have a Bears picnic and play frisbee in the park. That seeing a bunch of intoxicated bears in and around surfers could be 'beary' hilarious sight! I love his quick witted humour. Ermm however, this is not a conclusive decision, so if anyone has a suggestion fire away I'm up for some more hilarity! Today I have also (in between pulling my hair out over this blogger thing) been making another ATC for a swap early next month. The theme was 'House' so I thought I'd do a little digi pic of a 1950's lady in front of her cute little caravan (Mobile Home), but added some razzle dazzle with the must have kitsch garden accessory of the time the 'Pink Flamingo'. Here's the ATC not the best photo but you get the jist! I also managed to participate in one of the cyber crop challenges at Scrapboutique. This one was our guest stylist the lovely Sharon & her Puzzle Challenge. 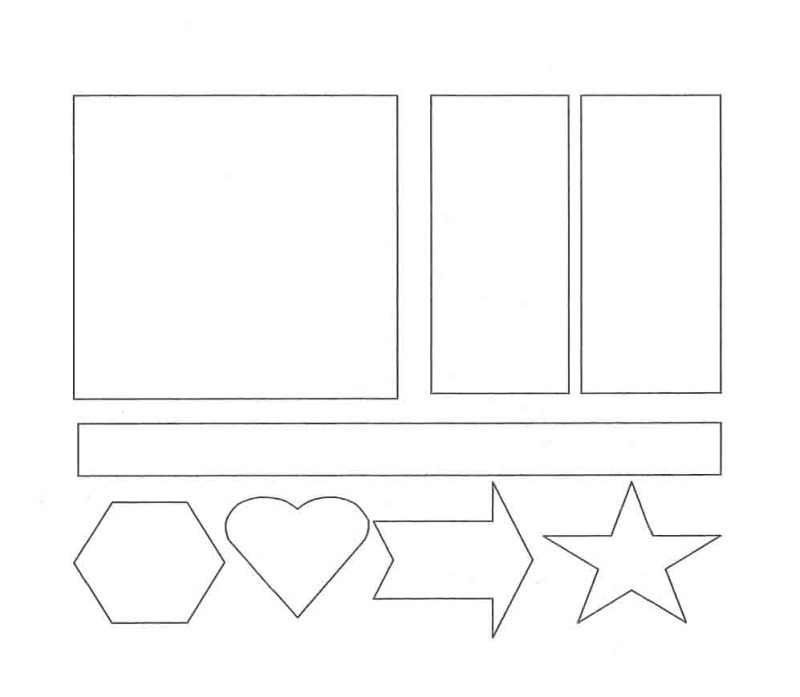 You had to use this sheet of shapes and create a LO using them. 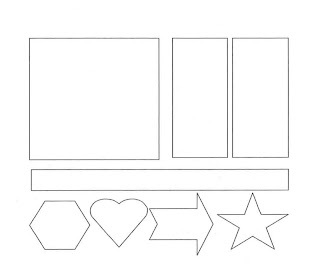 You could substitute 2 of the shapes with what ever embellie you wanted. I decided to do a digital LO and am thinking it could make a great sketch so here is the LO and sketch. If you want to use it just link it back to me you know the drill, I love to see your creations! Well thats it for me, off to lounge on the couch and snuggle up to my puggle! You are suffering from what is known as Lisa withdrawal. You should TEXT me cos we are going away tonight - all the way to SURFERS!!! 32nd floor and all!!!! Come visit - LOL. Love the koala party - toilet could be tricky - food will be easy - eucalyptus all round!! !